It seems like every time I get into a ride share in Uptown Oakland these days we’re peering out the window at the looming Sears building, wondering what’s going on, talking about what it could be and what it once was. Chatting about Uber’s failure (when in Lyft of course) and waiting for that wrapper to come off. In fact I was one of the last customers to ever buy something from that old Sears store on Broadway. I can remember it so clearly, it was sometime in late 2013, I bought a crappy dishwasher after wandering the semi-barren isles, sunburned by the incandescent lighting reflecting off the checkerboard floors, pegboards already 1/2 empty. The store was eerie, empty and ominous. Tenants often request that windows or flooring be replaced and expect that this is a routine repair. There is a distinct difference between capital improvements and repairs. Generally speaking, capital improvements can be passed on to tenants, so it is important to communicate with them about the differences before under taking major jobs that may increase their rent. Recently I had the opportunity to see my friend Mark Lipsett from Pacific Western Bank speak about the state of the multi family market. This was put on by our trade group East Bay Rental Housing Association, EBRHA which is a fantastic resource for anyone owning income property in Alameda county. Mark is a banker, so this was delivered through a lending lens, which is to say a relevant one based on data from his institution. In a particularly lengthy meeting, Oakland City Council voted to impose a 90-day moratorium on all rent increases not tied to the Consumer Price Index (CPI) and capping the maximum increase at 1%. Council President Lynette Gibson McElhaney brought forth the emergency ordinance- which is based from a draft created by housing activists in March. Pandora Media Inc. first moved to Center 21 in 2009 and has grown regularly since – and since then, many other companies have followed in the wake. According to the Oakland Chamber of Commerce, the city’s 400+ tech establishments have grown by between 4%-10% per year over the past 5 years. Tech companies also pay some of the highest wages in the city, paying an average wage of nearly $100,000 per year. The following map gives a good idea of the general proximity of the tech base. What does the oil slump mean for the economy? The price of oil has dropped sharply since the summer of 2014, settling to a 12 year low- and it prompts many questions- Will the price of oil stay low? For how long? How will markets react to stabilize? Perhaps most telling is the recent failure of oil cartel OPEC (Organization of Petroleum Exporting Countries) to agree on new production ceilings. This means that exporters still aren’t sure how to handle the lower prices. This is due partly to the fact that demand for crude oil has stumbled in China, as it pivots away from energy-intensive industrial growth towards a more consumption-led model of development. Section 1031 could be repealed! If you are an avid commercial real estate investor, you are probably aware, IRC Section 1031 has been considered for repeal for the past few years. Whenever you sell a business or investment property and you have a gain, you generally have to pay tax on the gain at the time of the sale. IRC section 1031 provides an exception and allows you to postpone paying tax on the gain if you reinvest the proceeds in similar property as part of a qualifying like-kind exchange. “Defer until you die, then let your heirs get the stepped up cost basis“, has been the motto of legions of authoritative investors for generations. IRC 1031 has played a crucial role in creating a fluid and fast-paced marketplace, as it has given many principals the opportunity to exchange properties, where previously, financial considerations would have prevented it. Sellers working feverishly to postpone the pain of paying tax on years of gains, have been a major contributor to market momentum in our asset class, often small apartment buildings. Exchanging is an engrained part of our eco system and critical to the success of small mom and pop apartment building owners in the San Francisco Bay Area. 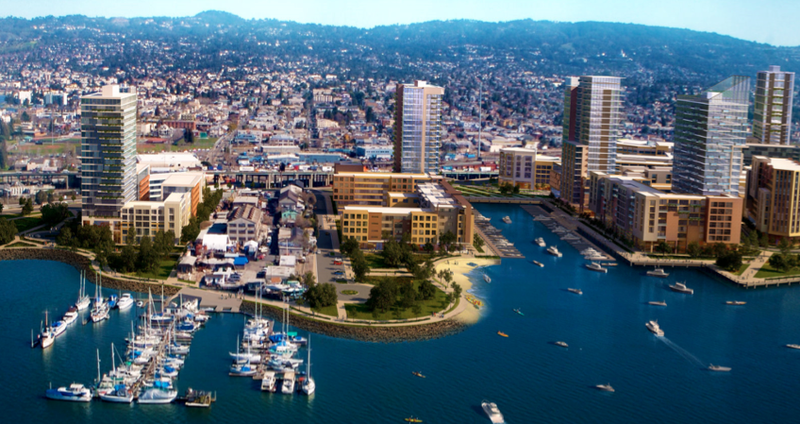 Recently I had the distinct pleasure of attending a couple of events that highlighted the scale and scope of four major development projects taking place in Oakland, California. One of the most interesting projects is one that I drive by every day along the Oakland estuary directly across from my home town, Alameda. It’s called Brooklyn Basin for obvious reasons, its similarity to Brooklyn. The $1.5 billion housing project sits on 65 acres, has over a mile of waterfront trails and is bounded by the Embarcadero, Oak Street and the estuary. It consists of 200,000 square feet of offices and store fronts, 3,100 housing units and 30 acres of parks and open space all on gorgeous waterfront. Wow, now this is something I can get excited about. Take a look at this spectacular video by Michael Sechman.